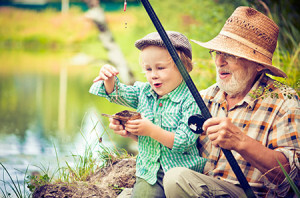 Experience fishing some of the finest ponds and lakes in the South located at Rutland Farms. We offer recreational fishing for the occasional fishermen and family outings while also serving as host to various fishing tournaments and professional clubs throughout the southern region. With 12 ponds available to choose from, we feel sure you’ll find your favorite fishing hole somewhere on the farm. Several ponds have concrete boat ramps that offer access to even the largest of bass boats to small personal kayaks. All ponds also offer good access to bank bound anglers. Pond maps can be found at the Strawberry Shack or at The Market at Rutland Farms. For fishing updates please call Josh Rutland at (229)848-5837. Before starting a day full of fishing please stop in at the Strawberry Shack to pay your dues at the honesty box and sign in. The fishing at Rutland Farms is a honor system so we ask that you please be honest. Available Year Round Monday through Saturday. To book your fishing tournament or for more information about club admission pricing, please contact Josh Rutland at rutjo10@gmail.com. We wish everyone the best of luck fishing. Don’t forget to stop by The Market for a homemade ice cream after a great day of fishing.